I'm getting pretty good at welding ABS plastic and repairing fairings. The front fairing I bought last week on Ebay had a nice chunk missing out of the side. The guy said in his ad that you would need to be a good body man to fix it. I've seen worse. broken fairing | Flickr - Photo Sharing! Close up of damage | Flickr - Photo Sharing! I got some 1/8" black ABS sheet stock and welded it into the broken spot. The trick is to clean all the paint off the repair area and then get good meld penetration without going through the plastic. You bury the iron into the crack and then push the melted plastic back into the crack from both sides. Then add some ABS welding rod into the crack. Essentially you blend the two sides together and fill the gap with hot plastic. It's as strong as the original. In this case I had to form the plastic to make the edge lip by heating and bending it slowly until it was the right shape. weld from behind | Flickr - Photo Sharing! close up of repair | Flickr - Photo Sharing! repair | Flickr - Photo Sharing! full front view | Flickr - Photo Sharing! Great work. If you ever manage to do a video, post a link, I'm sure there would be plenty of interest. WHS x 100! A lot of us have small cracks/breaks in our fairings and want to do repairs of this type but are fearfull of making the existing damage worse. A DIY detailing steps, materials, and tools would be very helpful and appreciated. Great work. 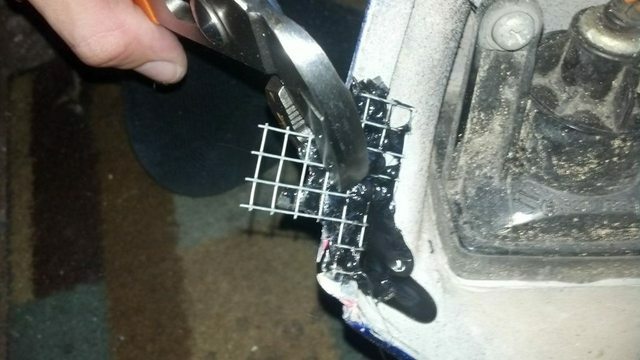 Mods, since this is an continuing problem for a number of forum members, maybe a dedicated "plastic welding" section would be appropriate? The collected wisdom of different techniques, materials, and tools would be very helpful. Sorry, I thought about doing a step by step after I finished this because the technique really takes a little more than what I wrote here. Welding the plastic is really the only way to get a strong finished product. I tried epoxy, hot melt and fiberglass and none of them hold up. 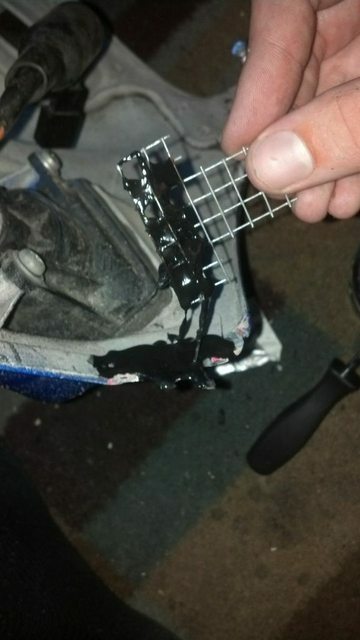 It's really important to get a strong bond and melting the plastic is the only way. I was a bit afraid at first, but the fairings actually are pretty forgiving and you can fix your mistakes pretty easy. I will try to put something together to show how to. I found a good video that shows the welding technique that I use. A couple of points that are only partually covered in the video. Tack welding is important in order to get the parts to line up. I tack weld starting on one side rather than the middle as shown in the video because on fairings you need to align the parts so they are in the right position. You can essentially "bend" the parts back together, particularly if there is some deformity in the break. The other important difference is that the motorcycle fairings are very thick compared to what they are welding in this video. Heat penetration is important to get a strong weld, so I push the hot tip into the plastic to just before it will break through the opposite side. 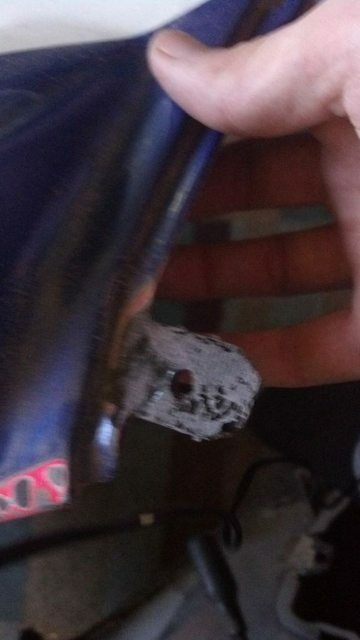 Even if you do go through you can fix it, but depth of the heat and melted plastic adds strength to the weld. When the iron tip goes in father there is a pool of plastic on either side that then is pushed back into the channel to meld the two together. I also add additional new plastic to the channel either with plastic rod or a sacrifical part made of the same material. You can buy welding rods on line, make sure you get ABS. Other plastics are not compatible and won't blend together. I always work on the back side and then sand and fill the finish side. You also need to do additional prep on your parts because the fairings have paint on them. I use a dremel with a sanding disk or cut off disk to remove the paint on either side of the weld. 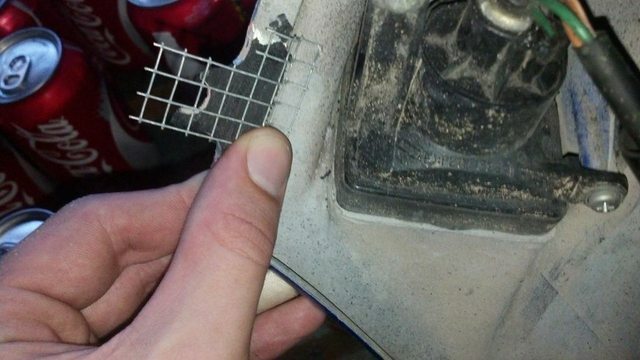 Don't worry if you gouge a little with the dremel because you can fill any damage. Just go deep enough to remove the paint if possible. Use sandpaper to clean paint in the corners or tight areas. Ventelate the work area. I also blow a fan on the work area to keep from breathing the fumes. Not sure how bad ABS is, but some plastic fumes can make you ill so make sure you aren't breathing them. Here's the video, good luck! Last edited by dennisgb; 04-07-2013 at 07:47 PM. ....despite the internet wisdom that says it doesn't work. I have repaired and repainted 4 Hondas now using WEST Epoxy. Nary a one of them has had any indication that the repairs are under the new paint. The VFR I did a couple of years ago had pretty extensive damage and chunks of missing fairing that I 're-formed' with s-glass and epoxy... I had a Honda NT 650 Hawk with the usual torn tail section and missing 'prongs' inside to fit into grommets to hold the bodywork....fixed this one with epoxy and rode it for about 10yrs. It still looked pristine when I finally sold it. So step right up and tell me 'Epoxy won't work' but I have found it to work just fine. Now maybe it is just cheap 5 minute epoxy that you get at the chain autoparts stores that doesn't work well, or something...Maybe it is my technique, (I am a boatbuilder sometimes) but it has worked every time for me. Maybe you should start a thread and show how you do this, because my experience is epoxy and fiberglass does not bond properly to the ABS. The welding process results in the plastic being melted together and new plastic added to strengthen the joint. My repairs are as strong as the original part and never break. If anyone is looking at this thread and wondering if Plastifix is a good idea. It is not. 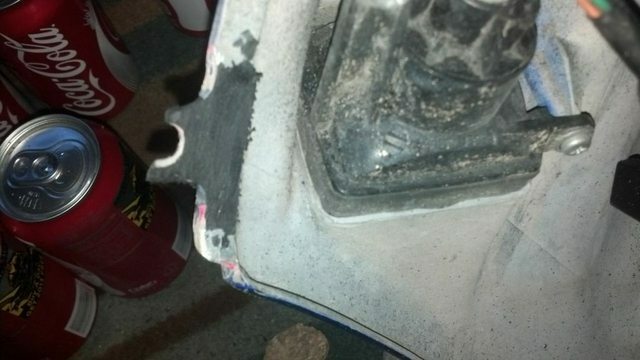 That stuff is so brittle that any crack you repair will re crack after any amount flex is given to it. 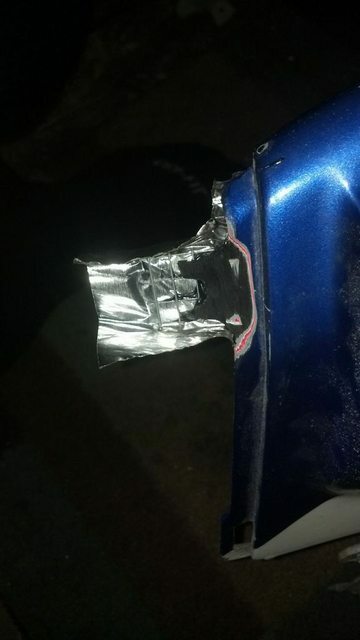 Here is how I did my fairing repair. I used a mix of acetone and ABS plastic to make a paste. this paste will melt itself into the existing ABS. As the video above shows, with heat welding, you are only getting the surface to melt over, while there is still a crack underneath. With any tension on the plastic it will snap again in the same spot. First step is to prepare the area. Remove all paint. 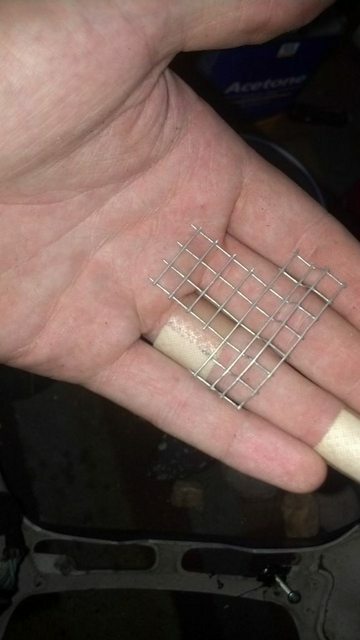 Next Step was to get some steel mesh and preform it to the are you are trying to fix. Add some aluminum tape to it after it has properly cured. we want to add ABS to the other side now so we don't have any visible mesh. Last edited by Zachy72; 08-02-2013 at 09:10 PM. Your method has merit and should result in a decent repair, but your comment that the welding method I showed results in a weak crack joint is incorrect. If you read the process the welding iron is imbedded into the crack to melt and bond it before adding more plastic to fill in the crack. I am a plastics engineer and any repair method can not be as good as the original molded plastic. This is due to a breakdown of the polymer chain structure in the molded plastic that gives it strength. Any solvent that melts the plastic completely destroys these chains and thus the strength of the plastic. Your addition of mesh is what is actually giving strength back to the joint. The welding method using heat is the least destructive because it is similar to the original molding process in that is does much less destruction to the plastic. It will randomize the polymer chains which does weaken it from the original orientation but much less so than using a solvent which completely breaks down the chains. The joints that I produced using heat are very strong. I have to disagree with your comment that they are not.